I love living in Central Florida. There is so much to do all year long, so many things to visit and so many ways to have fun. I know Mickey is the high lite of any trip to Florida, but how about a few other places not so well known. Before there was the mouse, there was Gatorland. I had always heard of this place where gators reside but never went. I have lived here for 12 years and hadn’t seen a gator yet. It was time to see them up close and maybe throw in a bit of mini golf too. But first, a little history about Gatorland and the star of the show, gators. 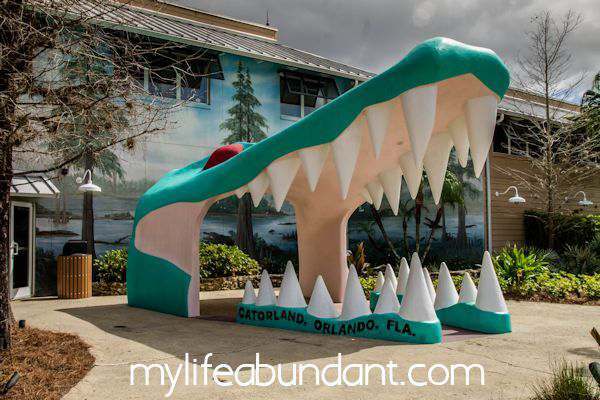 Gatorland is one of the oldest attractions in the Orlando area. Founded in 1949 by Owen Godwin, Gatorland has grown from a simple road side stand to a 110 acre park. The park is known for rescuing nuisance alligators from trappers that would otherwise be killed for their meat and skin. In 1962, Godwin’s youngest son, Frank designed the now famous gator mouth entrance that would be featured in movies like Indiana Jones, in the coming years. But, in 2006 the gator mouth, along with most of the gift shop connected to it burned. In 2008, the gift shop and historic concrete alligator’s mouth was back in service. The average American Alligator can reach up to 14 feet long and weigh up to a 1000 pounds. Females tend to be smaller than the males. The lifespan of an alligator has been recorded at over 80 years old. They are found in the Southeast regions of the US with an average of over 1 million gators in Louisiana and Florida each. They can stay underwater for up to 2 hours, which makes them so dangerous in local waters. There are several areas you can enjoy in the park. 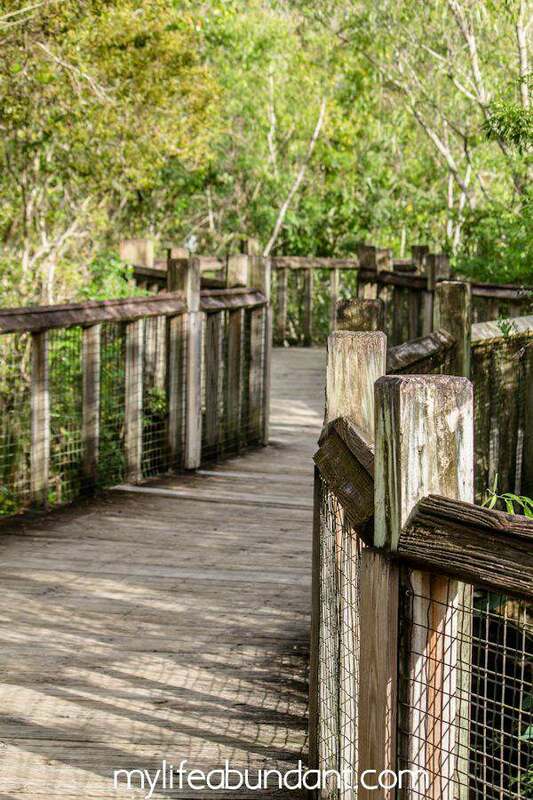 We first wanted to see where all the alligators lived and followed the wooden walkway to the Breeding Marsh. When we first got there, we only saw the eyes of the alligators peering out of the water. As time went along, you would see them start to reveal more and more of their bodies floating in the water. Hundreds of bodies. At any given time, there are about 1900 alligators at the park. Be sure to venture up to the top of the tower to have a much better view of the breeding marsh. 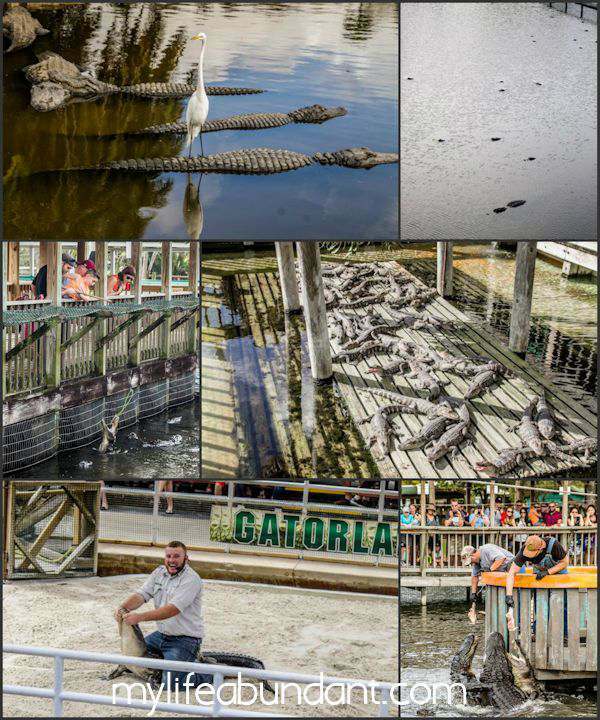 You can feed the gators, which is a training effort to teach them to jump to learn to retrieve food above the water. Be sure to stop by Bubba and Cooter’s show with the gators. The birds and gators seem to live very well together, which I found fascinating. I know we all have seen how gators are portrayed in the media, but they all seemed very calm and enjoying their day. There is gator wrestling, which was so entertaining and the kids loved it. 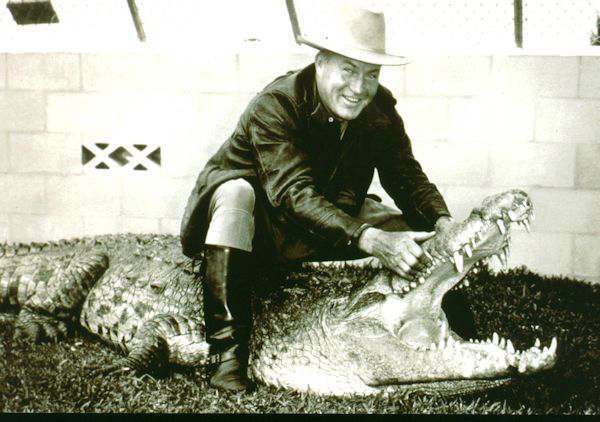 Gator wrestling has been a road side attraction in Florida since the late 1800’s. Speaking of the birds, there are so many to enjoy and a photographers dream. The bird in the top right hand corner of the picture above was trying to find a date. I watched for a long while as he strutted around in all his finest, but the girls would just fuss at him and fly away. All along the walkway are plaques which tell you about the birds in the area. There is also a bird aviary where you can feed the Lorikeets. 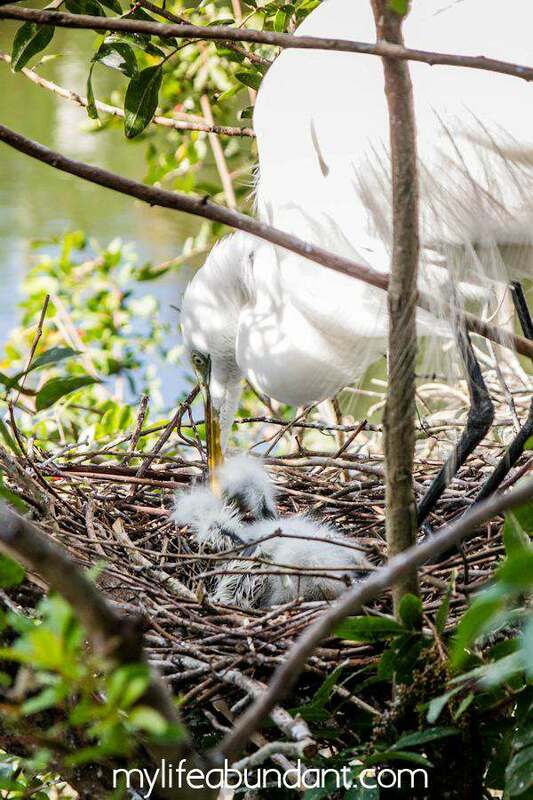 Spring is breeding time for the Snowy Egrets and we were able to see the nests and babies up close. They didn’t mind at all the humans who were all awing and ewing over all the babies. All of these nests were just a few feet above the water where the gators are. They stop in this area to raise their little ones and will then migrate north. Just to show you how nature works. Because of all the meat served to the gators, there is going to be some scraps laying around. Hence the reason for the many Black Vultures that hang around. 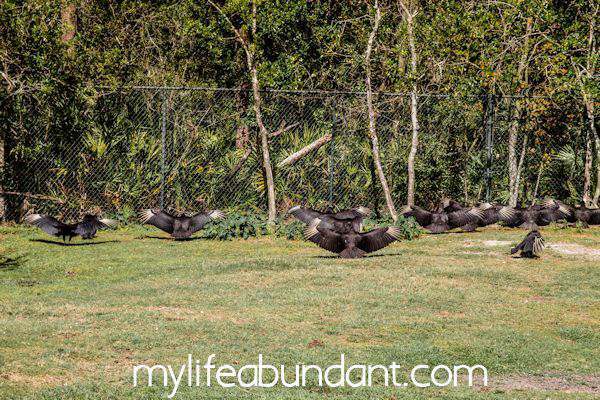 As we rode around the park on the open train amongst all the creatures, these vultures were all standing in a line with their wings out. Come to find out, since they are usually around old dead meat which is crawling with parasites, which end up on the vultures. One way to stay clean is to go in the water to wash and then stand with their wings out. The sun will kill off the parasites that weren’t washed off when they bathe. Evidently gators don’t like vultures as food. Gators have been seen trying to eat the vultures but will quickly spit them out. Vultures must taste as bad as they look. One of the newer attractions is the White Gators. 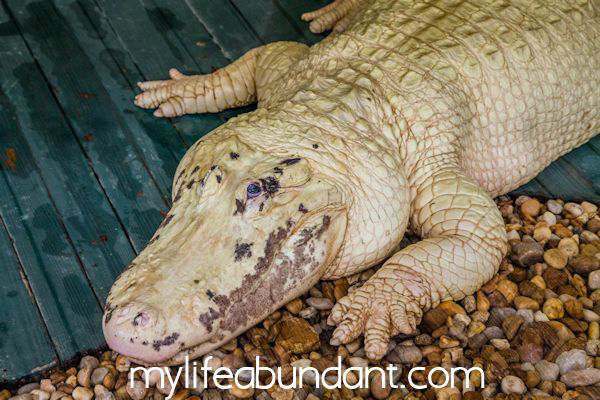 These aren’t albino gators since they have coloring. When I walked up to this giant creature, he slowly opened his eyes to reveal those dark blue cold eyes. They live in their own covered area called White Gator Swamp since long sunlight exposure will damage their skin. Too spooky for me. Other attractions are a petting zoo, Gator Gully Splash water park area for the kids to cool off in with picnic tables and plenty of chairs for mom and dads to relax on, a few creatures you can pet and see up close and personal and if you have a strong heart, you can go on the Screamin’ Gator Zip Line over the breeding marsh. There are so many activities for the kids to enjoy. 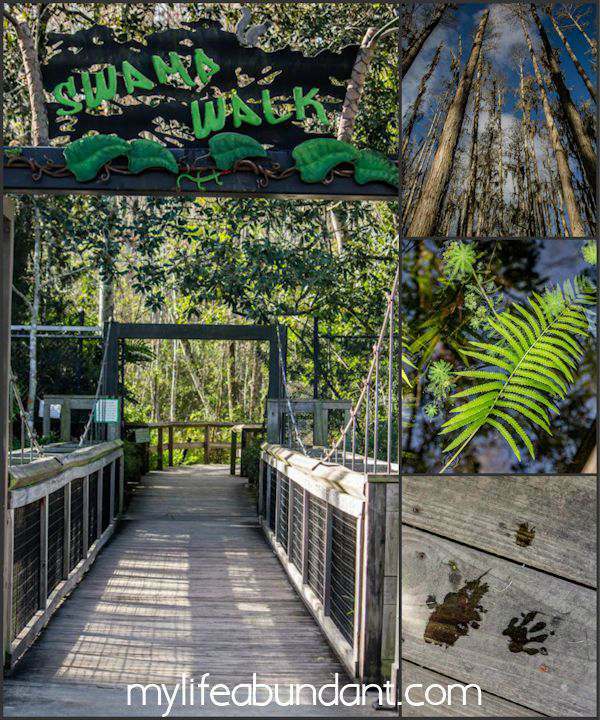 The Swamp Walk is the beginning of the Everglades where you can see what a true swamp looks like. Nature at its finest. One more thing. If you are adventurous and want to try something different to eat, you must try the Gator Ribs and Gator Nuggets. I’ve had Fried Gator Tail several times and its really good. If you aren’t into gator meat, no worries, hamburgers, hot dogs and other quick foods are also served. There are several package “Experiences” to enjoy. You can get up close and personal with the alligators in a variety of different events. 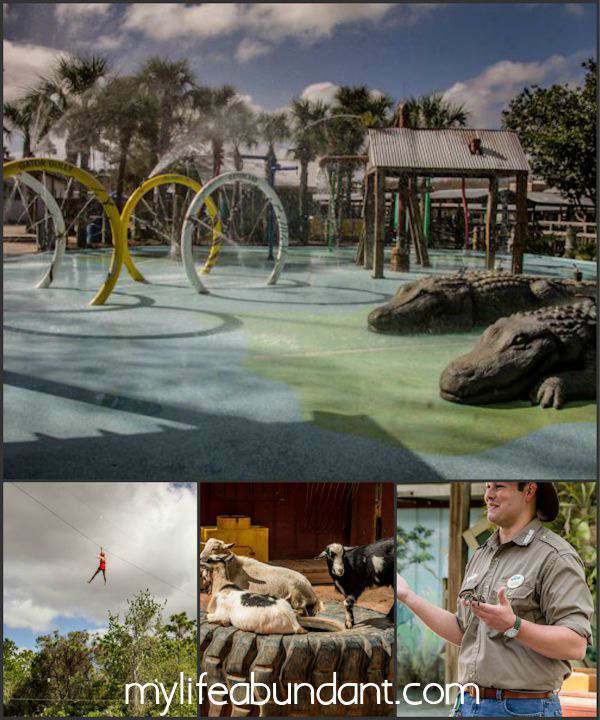 These adventure tours include simple events as learning how to alligator wrestle to walking through the alligator breeding grounds in a behind the scenes fashion. Oh, and I must not forget the part that really drew us to this attraction. Call 800-393-5297 to Gatorlands answering service and listen to the whole thing. Its a hoot!! But, our day wasn’t over yet. 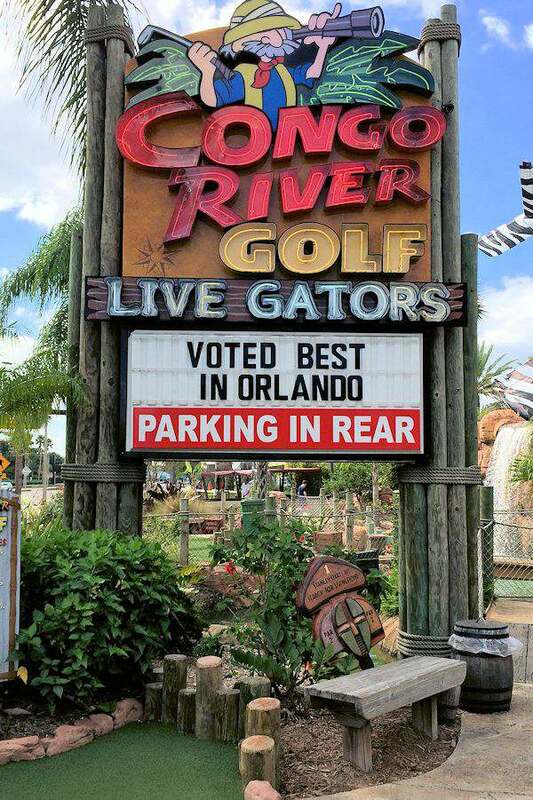 We had to check out Congo River Golf where you can golf with gators. 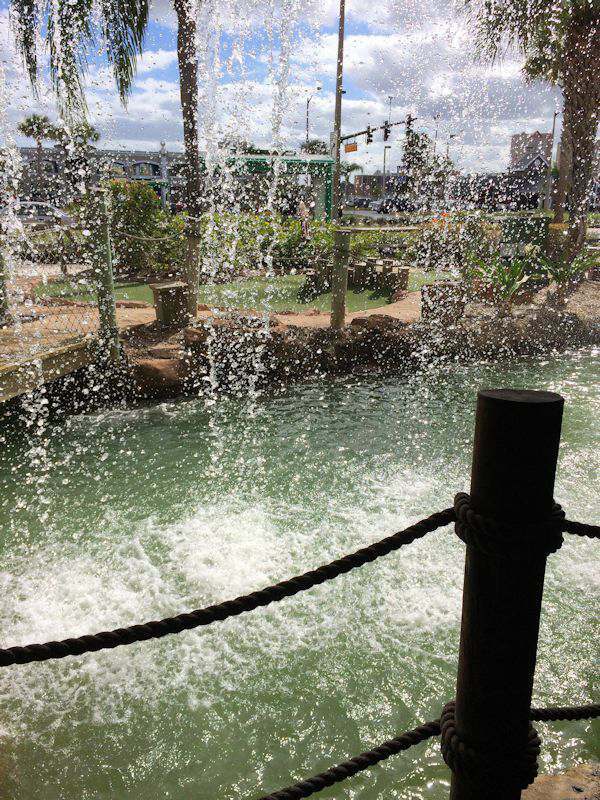 Hubby and I love to play mini golf and this one was one of the best we have encountered so far. We golfed in caves where you can watch the waterfalls. We loved the different levels of this mini-course. There were flat and high areas you needed to climb to. And when you are done playing the 18 hole course, you can feed the gators. 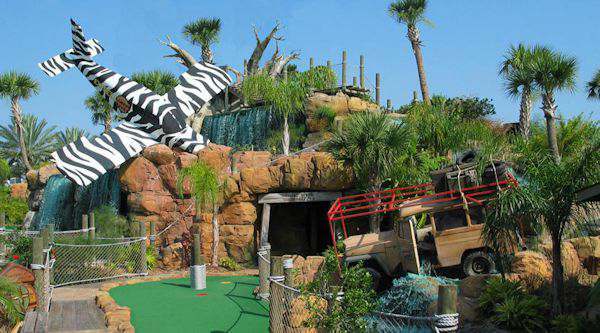 There are several of these Congo River Mini Golfs in the area to enjoy. We both had a great time and would recommend these two attractions to anyone visiting in the Orlando area. I just knew I was finally going to win a round of mini golf with hubby, but once again, I lost another close one. 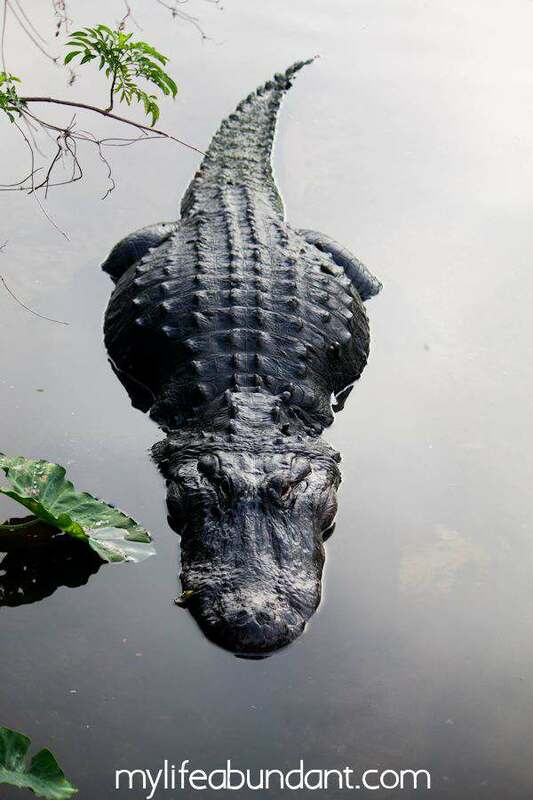 If you are planning a trip to the deep south anytime soon, it would be a good idea to find out if gators are in waters close to where you may be staying or visiting. There are several books about reptile and Florida Alligators HERE. Here is a really cute book for the kids with gators playing the mom and child called Hello, Florida. There are several other children’s books to choose from HERE. Wow. Calling all animal lovers out there. This place is for you! I love your post. I was a bit scared of alligators. I haven’t seen one yet in real life. I was surprised that one of the alligators has blue eyes. I never thought of that. And the birds, I love them. They reminded me of my trip to Jurong Bird Park in Singapore. Looks like such a fun and different place to visit! I have to say .. alligators are on the scary side for me .. but I’d love to see the Snowy Egrets. They remind me of the the nests we see around our house every year. LOVE THIS! We are always looking for cool places to visit. This looks amazing! This is so awesome! My son would love this! I had no idea that gators could live that long or that they could get up to 1,000 pounds. What a great idea for a family vacation. OMG this is such an amazing place! I love it! I haven’t been to this part of the country yet, but you bet this will be on top of my list! That place is so cool. I totally want to take my boys there. It sure looks like a fun place especially for the kids! I love that they have so many attractions for the kids to enjoy and I’m sure it’s going to be quite a learning experience as well. Good to know that they also have the chance to see animals up close. What a wonderful day! Both of these attractions would be so much fun to visit with my family the next time we are in Florida. Gators scare me! I don’t like how they are almost invisible in the water until they snap and grab their prey! The only way I would go and see these gators is if I was standing way back from them. I do mean a long distance. The white gator is rare and would be neat to view like I said from a distance. This looks awesome! I can;t believe you have lived in Florida for 12 years and had not seen a gator until this day when you visited Gator Land. LOL. Every time I visit I see one somewhere. 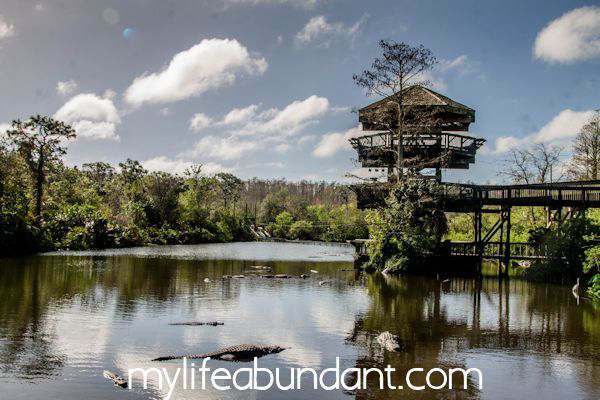 We did a gator excursion in the Everglades one time we were there and it was amazing! Loved how educational it was. I will check this place out next time I am nearby in Florida. From what I am reading it looks like I have more exploring in Florida to do! It looks like you guys had a great time and I definitely want to check out where you were. HI Jeanette. Its so worth going to. Especially if you have children. This place looks like so much fun! 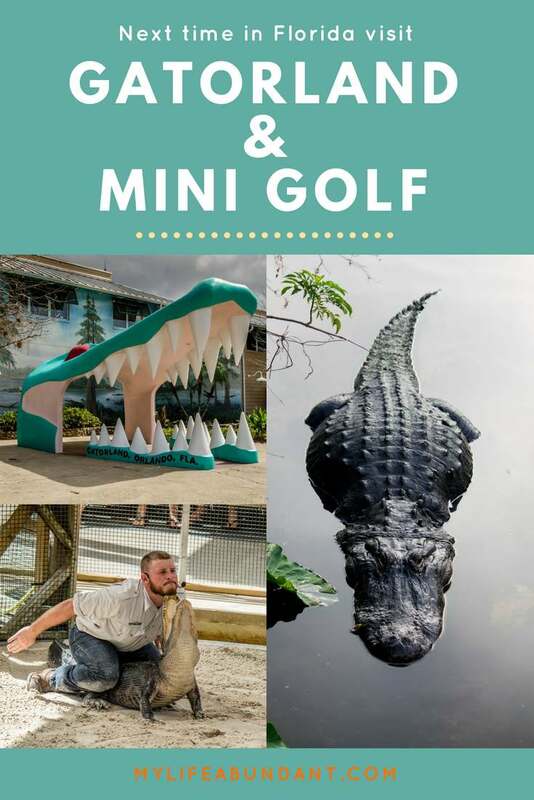 We love mini golf and gators make everything more fun (as long as they are a safe distance away!). Sounds like you had a fun time there! It looks like a fun place to spend the day. They have so many interesting things to see and do there. Thanks for sharing your experience! Orlando and Central Florida offer lots to do beyond Mickey. It’s great to see Gatorland being highlighted. This is a very interesting park to see! I will need to visit next time we are in Orlando – looks like an amazing place, and lots to see and do! 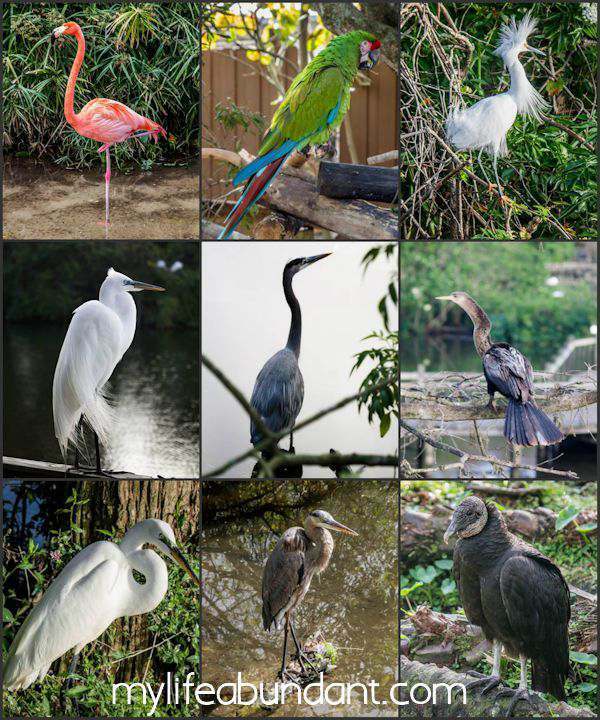 I love all of the birds in this park! The Gator park looks absolutely amazing. My family loves to be outside and learn about nature, but I might also be totally terrified of actual gators around my little guys. I’ve been to a similar themed park before. Gatorland does offer a great way to be close to nature and creatures of the swamp, however, I am really very scared of reptiles. Maybe my sons would be interested to go. They’re fascinated with stuff like this. Thank you for sharing your beautiful photos of the place. The albino gator looks scarier than the regular ones. This would be a great field trip for the kids. They can learn so much and have fun too. I am scared of alligators although a trip to this place would be very educational. I am sure the organizers are knowledgeable and smart. Kids would definitely enjoy this adventure. I am scared of alligators although it will be a nice experience to a join a trip to this place. I am interested in seeing the birds. They look fascinating. The venue is packed with different animals from large gators to small birds living among-st the gators but in their own habitat. Quite a sight if you have never seen an alligator closeup. I’ve never been to Gatorland but my husband took the kids a couple of years ago and they had a wonderful time. We really need to go back! I’m going to be visiting Florida soon, and this place is going on my list. I bet my kids would have a blast. Gatorland looks like an awesome place to spend the day! Those white gators are especially cool. This is such a beautiful, well thought out attraction. I’ve seen one gator in my life and that was scary enough. Creatures that lay very still and move slowly then attack unexpectely scare me. I’d still totally go here. It’s a fun place to be. I have always wanted to visit Florida. If I ever make it there I’m definitely visiting Gatorland. That’s really cool and a little scary! What a fun place to visit though for older kids! Gators tend to freak me out. You got closer than I ever hope to! haha But it does look like a lot of fun. Another fab place to visit woot. As long a those gators dont look at me for dinner, I am good 🙂 Thanks for sharing with me Gatorland! Wow what a fun time! It looks like this place would be so much fun for the whole family too. Awesome trip idea! I live in Central Florida too. We really like Gatorland, and it is a great place for a trip! I like the mini golf too!